10 Pieces + Cherrywood Handles + Metal Dowels (18 GA wire), .2mm layer height, .5-1mm engravings, aesthetic reload, articulated hammer/reload switch, rotating cylinder. The kit is awesome! Seller was kind and apologetic for a slight delay. But once shipped it arrived a couple days. the kit was easily put together as well. Thank you! 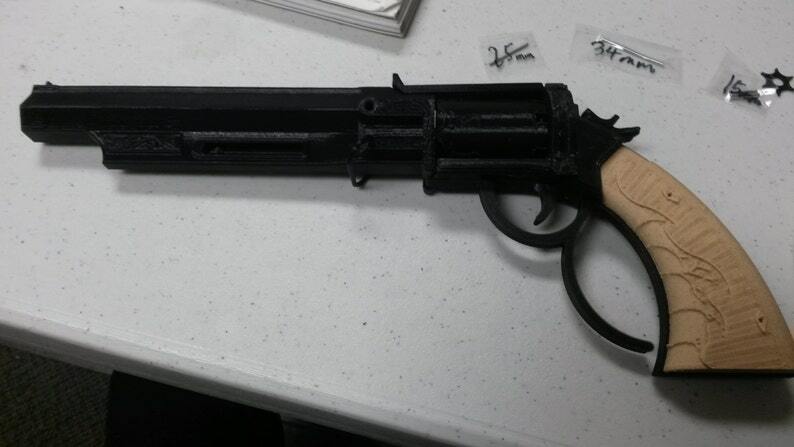 Awesome replica of the Hand Cannon from Bioshock Infinite. Package was sent very securely. Overall a good print. A few issues with the primer but there was plenty of communication and I got what I paid for.